TAMPA - Give Red Sox manager Terry Francona props for knowing his audience. Before the start of yesterday's exhibition encounter with the Yankees at Legends Field, he was queried about his starter for the day, the intriguing Bartolo Colon, who was scheduled to pitch three innings. Francona asked for - but acknowledged he probably wouldn't get - some perspective on the former Cy Young winner. "If he gets the Yankees out today, half of this group will want to anoint him," Francona said. "If he gets banged around, the other half will want to release him. "It's his second spring training game. He's getting his legs under him." The plan to give the hefty Dominican three innings quickly went awry when Colon, who was only a fastball or two away from escaping the first inning, instead gave up a two-run double to Hideki Matsui on a 1-and-2 count, then unraveled. By the time Francona sauntered to the mound, asking for his ball back, Colon had lasted just two-thirds of an inning, given up 4 runs, and thrown 41 pitches - just 21 strikes. "We got to the point," Francona said, "that we started worrying about keeping him out there too long." On the surface, the results were disappointing, but this is where Francona's plea for perspective comes into play. It's undeniable that Colon had command problems yesterday, but he did catch Jason Giambi looking at strike three with a nasty off-speed pitch on the inside of the plate. That was just after he engaged in a nine-pitch battle with Bobby Abreu before walking him. Early in the inning, he was clocked at around 95 miles per hour (buy into the accuracy of those numbers at your peril), and that is encouraging. There were reasons to believe when the Angels released him after two seasons of injury-plagued ineffectiveness that he might never be able to generate that kind of velocity again. And now he's smoking at 95 m.p.h.? "I think that could be about right," confirmed pitching coach John Farrell. "He pitched around 92, 94 miles per hour the last time out. His arm strength is impressive. "He has progressed to the point where the issue is not health. It's a matter of repetition." Chew on that statement for a moment. The issue is not health. When Colon hopped aboard with a nonguaranteed minor league deal in February, Sox general manager Theo Epstein termed the transaction a "no-risk, potential high-reward signing." That's Theo-speak for, "Hey, we've got nothing to lose." He was right. After all, Colon has won just seven games over the past two years because of rotator cuff surgery in 2006 and persistent elbow soreness last season. You wondered if he ever could be right again, particularly after the whispers that Colon had suffered small additional tears in his shoulder. The only issue was health. Like Wade Miller before him, he was a medical gamble. But now Colon's pitching coach is telling us that is no longer a concern. And, yesterday, after his brief outing, Colon said through a translator he "felt great," and that he hasn't experienced any pain since he's been under the watchful eyes of the Red Sox training staff. "This is what I need right now, to stay healthy," he said. "I'm asking God every outing to let me stay healthy." Colon was never really in the plans for the trip to Japan. He will stay behind, put in some work, and if all continues to go well, according to Francona, will get the ball again in one of the exhibition games against the Los Angeles Dodgers March 28-30. "He's going to help us win some games," Francona predicted. "We all feel that way." In his prime, Colon was both overpowering and consistent. From 1998-2005, he won 14 or more games all eight seasons, the only pitcher in the majors to accomplish that feat in that time period. He reached his zenith in 2005, when he was 21-8 for the Angels with a 3.48 ERA. He logged 222 2/3 innings - and hasn't been the same since. After winning his first five starts last spring, he won only one more game the rest of the way. He did not pitch against the Red Sox in the Division Series, and after seeking but not securing a guaranteed contract somewhere, he agreed to the minor league deal with the defending world champions. At least one Yankee, shortstop Derek Jeter, continues to eye Colon warily. "We've faced him a lot over the years," Jeter said. "He was one of those guys who just had overpowering stuff. There aren't many people who can stand up there, and you know what they are going to throw, and they get it by you anyway." It remains to be seen whether that Colon still exists. He'll turn 35 on May 24, and he concedes his best days were when he was in his 20s. "When he was younger, he'd just rear back and throw fastball after fastball," Jeter said. "He was always capable of throwing 100 miles per hour. "But, as he got older, he mixed some other stuff in. Lots of guys have made those adjustments. Colon did, too." The Red Sox have until May 1 to make a decision on Colon, whose slider and a changeup play nicely off his fastball. They feel it's critical for him to work on his conditioning (he is listed at 5 feet 11 inches, 250 pounds, which is a kind estimate), because the extra pounds, they believe, are affecting his mechanics. Instructing a player how to eat better is far less daunting than fretting about whether his elbow and shoulder are structurally sound. 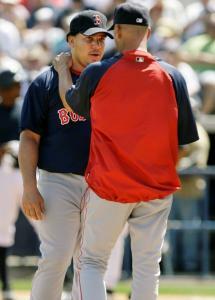 "He's had shoulder problems in the past," said Farrell. "But we saw him pitch in September, then we saw him again over the winter. Obviously he wasn't in midseason form, and he wasn't pitching with the intensity we'd like, but his arm was strong, and his velocity was good." "We're thrilled with his arm strength," echoed Francona. "He just didn't locate today." "I'm where I should be," Colon chimed in. The numbers in the box score were grim. Colon's ERA for the day was 16.88, and the three walks in less than an inning jumped off the page. Yet nowhere did the numbers reflect the growing excitement the Red Sox feel about their nonguaranteed minor league signing, who just might wind up as the steal of the summer.